Carl Sagan—who first coined the term—was tempted to call them "star-tar." Tholins are a broad group of organic compounds formed when simpler molecules are irradiated. They are extremely common in our solar system, and studies have shown that their properties are incredibly useful to emerging life. By tracking and understanding tholins, we might be able to find extraterrestrial life and even explain how life began on Earth. Powdery, brownish-red tholins made at Johns Hopkins University. Fractures on the Europa's surface ice. The red coloration is believed to be because of tholins. In order to build a second Earth, we need to look at how the first one was made. Humanity dreams of becoming an interplanetary species, but no other planet in our solar system can currently support complex life. In order to make a planet like Mars hospitable for us, we'll have to engage in a massive, decades-long terraforming effort. Much of what makes Earth livable, such as breathable air, tolerable temperatures, and so on, are the result of microbial activity from Earth's early history. Can we use microbial life to make the same changes on Mars? An artist's depiction of a Martian terraforming effort's progression. This image of the side of a Martian crater shows recurring slope lineae. The dark lines descending from the slope of the crater come and go with the seasons, which may indicate flowing water. The Mars Ecopoiesis Test Bed. These images show different elements escaping from the Martian atmosphere. From left to right, the images show carbon, oxygen, and hydrogen floating away to space. Our friendly neighborhood gas giant serves as a cosmic catcher's mitt. In 1994, a comet struck Jupiter, exploding on the gas giant's surface in an incredibly violent fireball. Such collisions are not uncommon for Jupiter. What is uncommon, however, are solar systems with planets like Jupiter. Without Jupiter, life on Earth might have been obliterated by comets and asteroids before it even got a chance to begin. The fact that Jupiter-like planets are so rare might be one of the reasons why we haven't found intelligent life yet. This GIF shows the fireball created by Shoemaker-Levy 9's first impact with Jupiter. We may not find Klingons, but what we do find will blow our terrestrial minds. 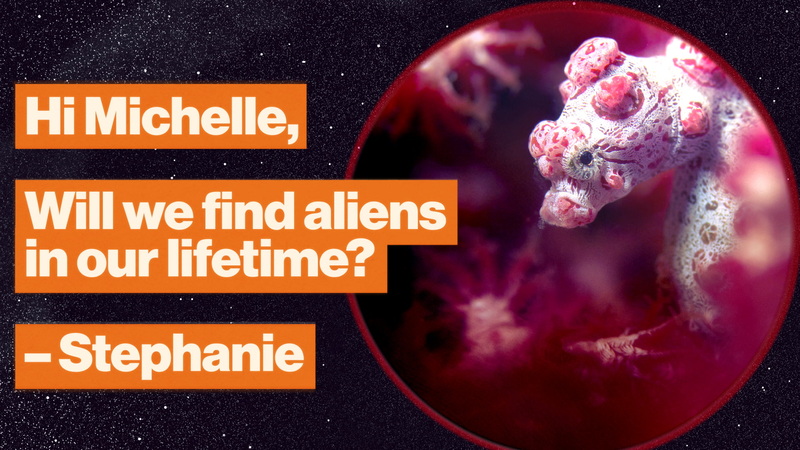 Want to place a bet on when we'll discover alien life? NASA's Michelle Thaller thinks it'll be within the next 50 years. "I actually have a bottle of champagne chilling because I think it could happen almost any day, when some of our rovers or some of our satellites around other planets come back with really interesting data," says Thaller. What will our first proof of alien life be like? Most likely microbial, but even those microbes will reveal so much: Does it have DNA? Is it similar to us? Is it different from us? How else can life evolve? These questions—and answers—will change our view of the universe forever. NASA research finds a new direction in searching for signs of life in the Universe.